Some of you may have heard of the strong earthquake that occurred in Japan today (March 11) about 2:45pm our time. It was by far the strongest that we've had since coming to Japan, lasting several minutes, and chasing ourselves and the neighbors out into the street. 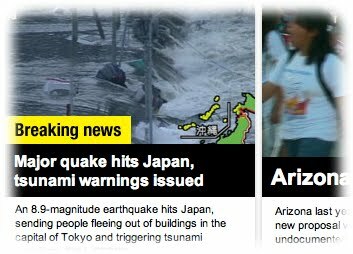 The quake was centered in Sendai, more than 100 miles north us. Sendai has had its share of quakes in the last couple weeks. We are still glued to the news to see what damage and casualties this has caused up north, and among our church association. Tsunamis along the coast have already made quite a mess of things and no doubt taken many lives. We have been watching on live TV as the cameras have shown many cars and vehicles being swept away, and many fires. The hardest hit area is close to one of our church locations, and several others are in the area. A larger tsunami is predicted to come soon. We ourselves are fine. A few things were knocked to the floor, but that's about it. The phone lines are down, but internet is still up. 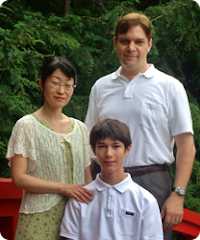 We are waiting for Justen's return from school in Tokyo. The trains are stopped for now and his return for school will be very delayed. There have been two strong aftershocks in the last hour (those chased the neighbors outside, too), and a small one while finishing this sentence. We are used to earthquakes in Tokyo. But having everything moving around you is still a VERY unsettling feeling.